Barbara van Schewick, Susan Crawford, and other women who won net neutrality. 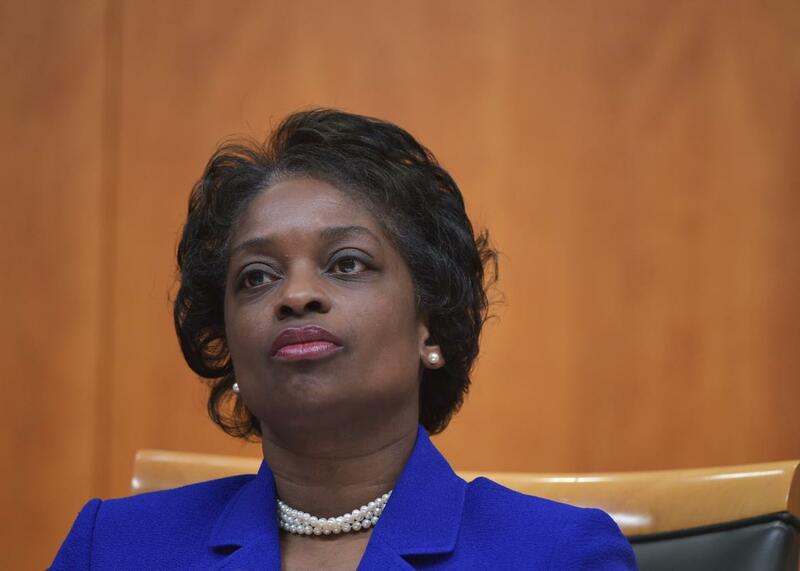 Federal Communications Commission Commissioner Mignon Clyburn listens to a fellow commissioner speak during an FCC hearing on Feb. 26, 2015. Earlier this month, Politico Magazine listed me among the top 50 “thinkers, doers and visionaries transforming American politics” for my work in coalitions advancing net neutrality—the principle that cable and phone companies should not block websites or create online slow lanes and paid fast lanes. Over the course of a year—from January 2014 to March 2015—millions of Americans, hundreds of businesses, and dozens of policymakers weighed in at the Federal Communications Commission in favor of net neutrality. Despite the overwhelming political might of the cable and phone companies that opposed the principle, and despite a prevailing conventional wisdom all last year that it would be “impossible” to beat them, the FCC sided with the public and adopted extremely strong net neutrality rules that should be a global model for Internet freedom. On Monday, dozens of academics, nonprofits, and companies filed legal briefs in court defending that important order. Because the victory at the FCC is so important for economic policy and was so shocking a political victory, many news organizations have profiled those responsible. Over the past months, in addition to me, many men have received credit—including Federal Communications Commission Chairman Tom Wheeler, President Barack Obama, HBO host John Oliver, and Tumblr CEO David Karp. While these men (and others, especially in the nonprofit community) played critical roles, none deserves more credit than the frequently overlooked women who helped lead the fight. Even if we guys managed to hog the credit afterward, a disproportionate number of women in the public interest, tech, and government communities had the guts and brains to lead the public to victory. They canceled annual vacations, worked around the clock, didn’t see friends and family as often as anyone would want—and ran a brilliant campaign. They should be recognized. Barbara van Schewick, a Stanford law school professor who also has a Ph.D. in computer science and expertise in the economics of innovation, had a bigger impact than anyone realizes. She wrote the book on net neutrality and some of the most important articles on the topic. While teaching a full load at Stanford, she flew to Washington almost monthly and had more than 150 meetings at Congress, the FCC, and the White House. No one individual met more often with the White House or FCC on the issue, according to public records. The FCC’s decision (and footnotes) reflect her work. She had a bigger impact than entire institutions. She is not a normal human, but thankfully she’s on the public’s side. Alongside Chairman Tom Wheeler, FCC Commissioners Jessica Rosenworcel and Mignon Clyburn cast two of the three votes for network neutrality. At the start of the public process, last May, each clearly signaled her willingness to support strong net neutrality rules. Clyburn publicly championed strong mobile rules, and Rosenworcel argued for a full and open public process. Further, Wheeler’s team included the brilliant Gigi Sohn, who made sure he met with business and civic leaders outside of D.C., and Stephanie Weiner, a top FCC lawyer who drilled in on every aspect of the legal analysis to make sure the order has its best shot of being upheld in court. The fights for media justice and racial justice have been intertwined since the 1960s civil rights movement. During the last year’s net neutrality fight, leaders like Jessica Gonzalez of the National Hispanic Media Coalition, Malkia Cyril at the Center for Media Justice, and Brandi Collins at Color of Change explained to policymakers and the public why disadvantaged groups needed an open Internet—to tell their stories, to organize, and to build political movements such as Black Lives Matter. Gonzalez, for example, testified before Congress and was part of a New York Times op-doc video conveying these points. Despite political opposition from the powerful lobbyists at the cable and phone companies, some women across government stuck their necks out for the public. Rep. Nancy Pelosi lent her powerful voice in favor of strong net neutrality rules, as did Sens. Elizabeth Warren and Barbara Boxer. At the White House, the nation’s chief technology officer, Megan Smith, ensured that President Obama met directly with engineers who invented the Internet and World Wide Web. Hillary Clinton, a longtime network neutrality supporter, spoke out in favor of the FCC’s plan in the critical days before its adoption. The New York startup community defended net neutrality with visits to Washington, op-eds, legal filings, and joining activists in a day of mass action driving 300,000 calls to Congress. Althea Erickson led Etsy’s engagement, speaking for Etsy sellers, 88 percent of whom are women. The creative Liba Rubenstein led Tumblr’s policy team; the aggressive lawyer Michal Rosenn and savvy communications head Julie Wood led Kickstarter’s legal and communications engagement; Jessica Casano-Antonellis and Andrea Allen supported Vimeo’s efforts to spread the word with videos and user education. They worked with Engine Advocacy’s Julie Samuels, Liz Simon of General Assembly, New York Tech Meetup’s Jessica Lawrence, Shana Glenzer of the D.C. Tech Meetup, the Internet Freedom Business Alliance’s Lauren Culbertson, the Computer and Communications Industry Association’s Cathy Sloan, and Comptel’s Angie Kronenberg. Over at the larger companies, Sheryl Sandberg at Facebook filed to support network neutrality, and Johanna Shelton, Susan Molinari, and Rachel Whetstone led Google’s thinking and advocacy on the topic. These women saved the Internet and transformed politics They deserve the respect and gratitude of all of us who care about free speech in the 21st century. *Correction, Sept. 22, 2015: This post originally misspelled Jennifer Calloway’s last name.